The motorscooter is the cheapest, easiest-to-drive vehicle imaginable (See Motorscooter Freedom). The Twist-and-go motorscooter (and practically all of them are these days) is fully automatic and has only two controls to worry about: throttle and brakes (See Driving a Motorscooter). With 80+ MPG for 150cc models, and 100+ MPG for 50cc models, every gas dollar goes much further than with a car (See Motorscooter Economy) and an inexpensive motorscooter will pay for itself in gas saving very soon (See Motorscooter Return On Investment Calculator). How much extraneous and unnecessary weight we choose to shunt about (much too much). What we do with the kinetic energy once it a vehicle is put in motion (we simply throw it away). The second of these can only be solved with a fundamental change in fuels and braking design (there is an electric scooter that does this. See the XM 3500 Electric Motorscooter). The first, on the other hand, is something solvable to a large extent by the use of lighter, more efficient vehicles � motor scooters, for example. Every cruising SUV or minivan driven by a single driver involves repeatedly accelerating thousands of pounds of steel and sundry other materials in order to convey its 100-300 lb. driver from point A to point B. The 10 (plus or minus) miles per gallon common to such vehicles is only finally causing consternation in some after gasoline in the US topped $4 a gallon. 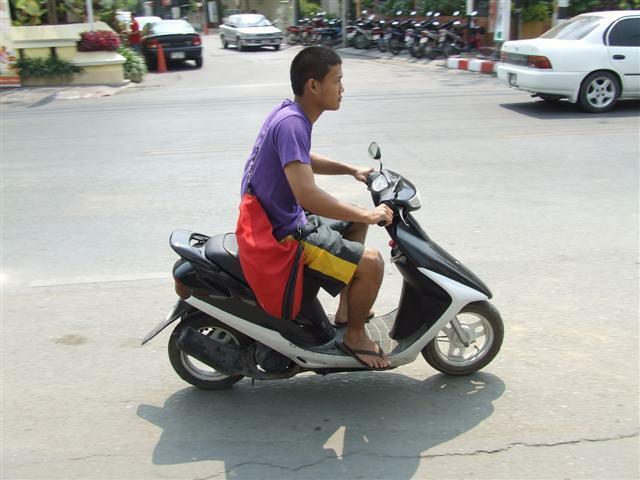 A scooter, on the other hand, commonly weighs less than its driver � certainly less than its driver and a passenger, and gets probably something in excess of 80 miles per gallon (See Scooter Economy). Reducing fuel usage by nearly a factor of 10 is a very significant savings in natural resources and emissions, as well as cost (Besides -- they're cute). Further saving can be achieved in any vehicle through clever driving practices (See Fuel-efficient driving). Safety is always an issue but scooters have some significant advantages relative to motorcycles. See Motor Scooter Advantages. 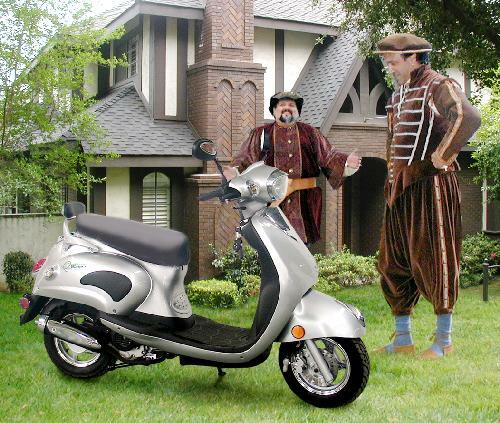 For more cogent and compelling arguments for riding a scooter, please see Business Scooter Travel, Motorscooter Advantages, RVs and Motorscooters, and the many other pages here. If you need help persuading your parents, spouse, children, or grandchildren that you should have a motorscooter, see our Motorscooter Economy page, which has an email form all prepared with solid sound arguments ready to send off to whoever needs persuading.